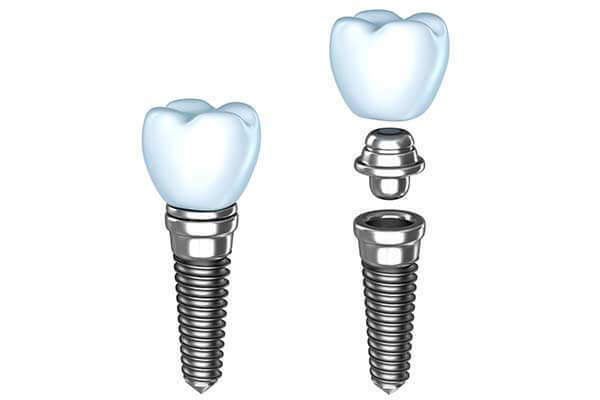 An implant is a surgical grade titanium fixture that is placed into the jaw to replace one or more missing teeth. It acts like a tooth root and is placed to receive a crown fabricated by your dentist. We use implant systems that have proven dental therapeutic history and are recognized by the American Dental Association (ADA). We will coordinate your therapy with your restorative dentist to insure a seamless treatment plan between our offices. Implant therapy may be a two stage process. The first is a surgical procedure using local anesthesia and sterile technique to expose the site and place a titanium fixture. Stitches are placed, post operative instructions are given, and several hours of inactivity are suggested following surgery. It is necessary for you to return in about one week for a post operative appointment, and we follow your healing closely for several more weeks. There may be a second appointment depending on the implant system. The second appointment is to uncover the top of the implant and place a fitting called an abutment to enable your dentist to start the process of making a crown. This is a minimal surgical visit with little post operative impact. Implant therapy is time consuming and the healing cannot be rushed, but under certain circumstances the process can go more quickly. The doctor will discuss these events when appropriate. We work very closely with your restorative dentist to insure the best possible outcome. There are factors that can contribute to failure and these should be discussed with your surgeon. It is important that you have a good understanding of all surgical procedures, restorative therapy and cost before you engage in implant treatment. Dental insurance varies as to coverage for implants, but patients are responsible for the total fee. Our office requires payment prior to the first phase of the treatment. If you have any questions or require addition information please ask any of our highly trained staff or your Doctor.